Pakistan's Saeed Ajmal has been cleared to play for Worcestershire in 2014 but the county will lose him for longer than expected later this summer. The 36-year-old spinner was granted a visa after his release was confirmed by the Pakistan Cricket Board on 16 April. However, international commitments mean he may only get to play for two months. After the Caribbean Premier League from 5 July to 10 August, Ajmal will then join Pakistan for a two-Test, three-ODI series in Sri Lanka starting in August. Ajmal, who confirmed his New Road return in November, is now expected to be back in England in time for Worcestershire's next County Championship fixture, against Derbyshire, starting on Sunday. Worcestershire have received a No Objection Certificate (NOC) from the Pakistan Cricket Board, clearing him to play. The off-spinner, a hit when he first joined Worcestershire in 2011 before starring against England that winter, will have had almost a month off following Pakistan's exit from the ICC World Twenty20 in March. Worcestershire director of cricket Steve Rhodes said: "Saeed is a very special talent, a lovely guy and will be great for our dressing room. "This guy is one of the best bowlers in the world so for us to pull off a coup in signing him is tremendous. "He is top of the tree and he is a very good asset to the club. For his age, his excitement, energy and enjoyment for the game of cricket is quite amazing." 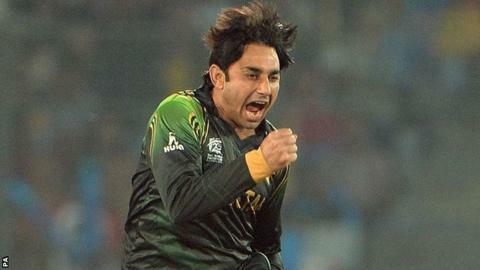 Ajmal will potentially be available for nine County Championship matches and 12 T20 Blast matches.